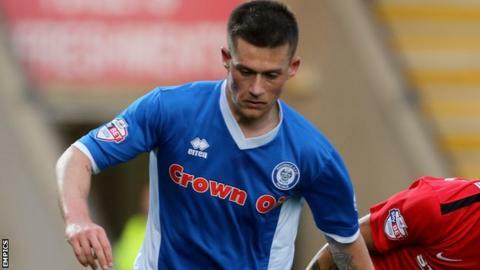 Rochdale forward Donal McDermott has revealed he "wasn't living right" before being granted a Football League lifeline by the League One club. After coming through Manchester City's youth system, he dropped into non-league before joining Dale in May. The 25-year-old scored a stunning goal in Tuesday's League Cup first-round win over Coventry. "I was totally out of the game, I was just working, so when I got that [offer] I was buzzing," said McDermott. McDermott was in Manchester City's FA Youth Cup-winning team in 2008 - a side that also contained Daniel Sturridge, Kieran Trippier and Dedryck Boyata. He told BBC Radio Manchester: "It's my own fault, I wasn't living right - but since I've got this opportunity I've been trying to change the way I live and just enjoy football." McDermott - who has played for Chesterfield, Huddersfield and Bournemouth - also revealed how a controversial tattoo keeps him from slipping back into past habits. "It's a teddy bear that's cut its own head off with scissors in its hands," he added. "People will say it's weird but I got it as a reminder to not do things that I was doing. When I look at that, I don't want to go back to before."